CEO Don Thompson blamed the economy for the fast food giant’s lackluster performance, pointing to “the external environment including declining consumer sentiment, high commodity and labor costs and heightened competitive activity.” Translation? Between the rising price of food (thank you, climate change), growing consumer awareness of McDonald’s bad business practices, and competition from the likes of Taco Bell, McDonald’s was having trouble maintaining its normally high rate of growth. The Washington Post initially reported the news, which McDonald’s released late on Friday, perhaps hoping that it would go unnoticed by the media. The stock market noticed, as McDonald’s shares dropped $4.14 or 4.7%. That makes for a lot of sad shareholders, too. But this blogger isn’t sad, and let me explain why. 1. Of course I like better food than McDonald’s. (Duh). Anyone who spends a big chunk of their time cooking delicious vegetarian food from scratch is probably not bingeing on Big Mac’s while writing up their blog posts. I don’t find their food appetizing and the methods of cooking those foods don’t support the healthy lifestyle I choose. 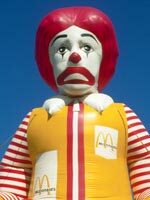 If McDonald’s starts to realize that they are losing business due to “declining consumer sentiment” maybe true changes will make the chain into something worthy of improved sentiment. Recent movements have shown that chains will respond to widespread consumer complaint. Taco Bell agreed to pay more for tomatoes after the Coalition for Immokalee Workers were supported by college students across the country who boycotted the chain to support the tomato pickers. For 11 years Chipotle required their pork suppliers to raise pigs outside or in large cages and use antibiotic-free and vegetarian food and debuted a commercial highlighting their “happier” pigs during the 2012 Grammy awards. The day after the ad ran, McDonald’s also pledged to stop using gestation cages. Maybe a bigger push for healthier items will encourage a real significant change to the menu and the practices. 3. Fewer meals eaten at McDonald’s makes us all healthier. As a student of public health, I am aware that the increase in meals eaten outside of the home has mirrored the rise in obesity and diet related diseases. Right now Given McDonald’s current menu, most meals are not supporting healthy choices. The impact of obesity and diet related diseases hits all of us, regardless of the size of our waist. In the United States, we spent $147 billion on health care costs related to obesity. That puts a new spin on the dollar menu. Even though McDonald’s executives and shareholders might be a freaked out by this news, I take hope. Not because I want McDonald’s to go out of business (although I could think of worse news), but because I want them to see that their consumers want better. Even those on a limited budget or with limited time know that they deserve better. Other chains are stepping up to provide fresher, healthier options with attention paid to social issues that their consumers identify with. Next Post Next post: BOO-ba Ganoush!